The motorcycle jacket with airbag offered to motorcyclists by Helite works mechanically. The benefits of this technology are many and are not to be underestimated. 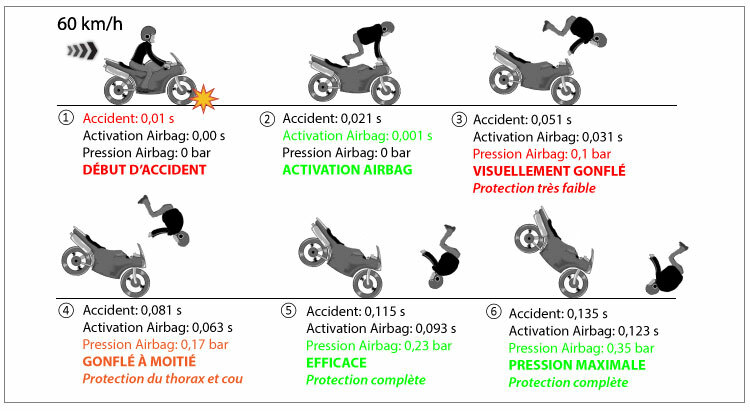 The following illustration explains in a basic way the importance of the correlation between the detection of the accident, the speed of inflation and pressurization of the motorcycle jacket. This very simple to understand technology has the great advantage of being extremely reliable. No electronics, no batteries, the CO cartridge have a 10 year guarantee, you can ride in peace without having to worry about the proper operation of your airbag. Illustration of the mechanical system integrated into the motorcycle jacket. This system is delivered ready to use, is easy and fast to install on all vehicles, for the driver and / or the passenger. You can equip several vehicles, the cords are universal. Your motorcycle jacket snaps to any Helite attachment cord. A new cartridge of CO2 and the user reactivates his airbag himself in less than a minute. In addition to the affordable purchase price of a wired airbag, also save on gas refill for re-use. The price of a CO2 cartridge 60 CC for moto Helite is $35.00. A small harmless slide happens to everyone and the motorcycle jacket is triggered, it have not have to be very expensive and you have to be able to reuse your airbag jacket without delay. When you make long trips, take an extra cartridge along just in case. 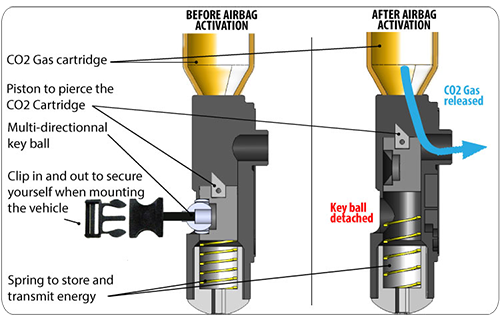 Go to the explanations of reactivation of airbag.